One, one and one. – Dirty wet dog , boats and sailing. No ! none of that “Ein Reich nonsense, its just that its one month down, one project nearly finished and one hoover (new last year) all but dead. One month. Its been almost universally windy and wet here so i have had little chance, and no desire, to either go down and see the boat or even peel back the cover of the project boat in the drive. What has happened here is that the first bulbs have just flowered, so far only a few of a previous years planting of crocus and a couple of daffodils in the woodland section in the front garden. 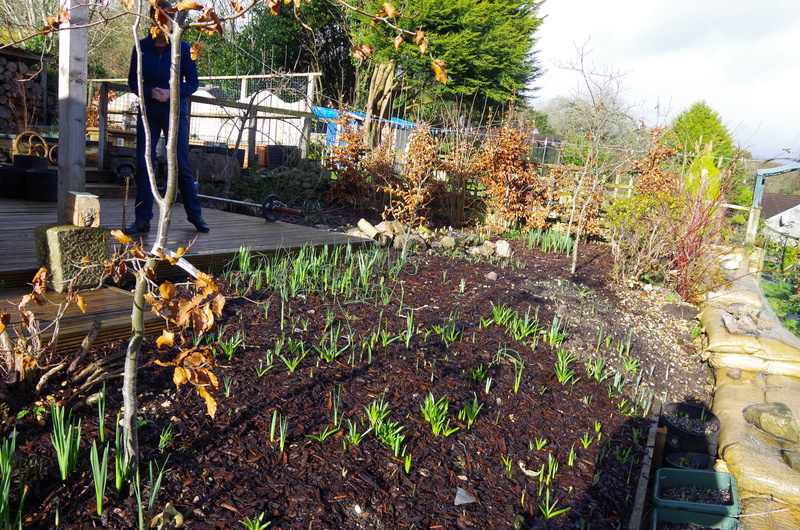 Loads of bulbs are poking through now so its going to be a blaze of orange, yellow and white here in a couple of weeks. After that i should get a longer period of different flowers in each part of the garden although for some reason i never seem to get much effective colour after about June. This year though i should get the crocuses first, then daffodils and lots of narcissi, then a break before a huge burst of tulips and then the alliums should come through….some of those are the giant ones which i am looking forward to seeing this year. One project down (almost) This was the month of getting the bathroom completely stripped out and rebuilt, last week the sparky put the lights in and i finished off with a nice little job of building a new wooden frame around the old mirror which being very large ‘expands’ the size of the room. Only in one way is the project not quite complete because i am now working through the house repainting surfaces that got damaged or look grubby now against the new super-clean paintwork. Yesterday i finished one paint job that i really dislike which is painting the stair banister and risers which is fiddly, finicky and just awkward. I am still cleaning up building and paint dust….today we have stripped most of the sofa cushion covers off to go through the washing machine as every surface i know was covered in dust at some point. Look, you know how it is with me and hoovers but seriously ! we have had this one for what ? 4 months and it’s screaming like a banshee already. The last one, fair enough, i do give them a hard time what with epoxy and grp dust which i know is very abrasive and i fully expect to destroy a cheap one on a big project. The one before our last one again, fair enough, that was my fault too and maybe it was a mistake to hoover up some not quite extinguished cramp-ball after a session of learning how to do fire-by-friction for a bushcraft course……the daldinia re-ignited inside the dyson ! so that didn’t go well. But there again there was this one hoover that survived years of me abusing it aboard the big yellow boat, wet or dry, abrasive or just plain nasty waste an it just sucked up the pain year on year. Previous First boat, dirty talk. Ahh Vax I remember him well, Henry did OK as well, he seemed to keep smiling ! I think he was the next one up from Henry !